ROBERT EVERSZ is the author of six novels that have been translated into 15 languages. He received an MFA from the UCLA School of Theater, Film, and Television and continues to study and teach film in addition to writing fiction and nonfiction. His novels include Shooting Elvis, named best crime novel of the year in Oslo’s leading daily paper, Aftenposten, and best comic novel in the Manchester Guardian; Gypsy Hearts, given a starred review by Kirkus; Killing Paparazzi, which was named among the best books of 2002 by the Washington Post Book World; Burning Garbo, a finalist for the Nero Wolfe Award; Digging James Dean, listed as an Editor’s Choice in the Boston Globe and Mystery of the Month by BookPage; and Zero to the Bone, given a starred review by Publisher’s Weekly and listed by January Magazine as one of the best books of the year. 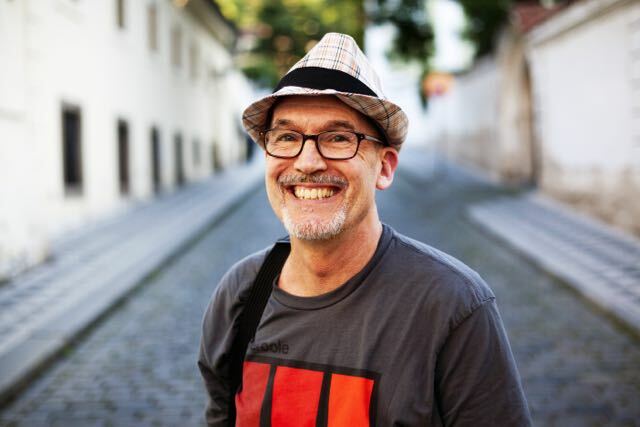 Robert teaches workshops in the novel at the UCLA Extension Writers’ Program, and is a member of the permanent faculty of the Prague Summer Program, where he leads an annual workshop in long-form fiction. He served as the final judge for the Association of Writers and Writing Programs’ Award Series In the Novel, and has been Visiting Professor and Writer in Residence at Western Michigan University. He’s currently Visiting Writer at Hood College. He is a member of PEN, AWP, IACW, and MWA. He has maintained at least part-time residence in Prague since 1992, though now spends most months in the States with his wife and two children. In addition to writing and teaching, Robert offers developmental editing services to writers who seek a sharp editorial eye and guidance toward perfecting the next draft.